A salvage crew finds an ocean liner that disappeared many years before. The crew soon finds that they’re not alone and whatever is on the ship is determined to kill them all. What sets [easyazon_link identifier=”B003VA3JUO” locale=”US” tag=”rabidreaders-20″]Ghost Ship[/easyazon_link] apart from other films of the genre is its cast. Gabriel Byrne plays the salvage ship captain while Julianne Marguiles and Ron Eldard play members of the crew. The Antonia Graza is a clear call-back to the Titanic though in the case of the fictional ship, it vanished rather than sunk. When the crew finds the ship, they can’t believe their luck but by the end of the piece will any of them survive to enjoy their windfall? The movie opens on a scene of the ship in its heyday. Many of the passengers meet a gory demise leaving them cut in half with the exception of a little girl who was short enough to survive but must then escape the miscreants looking to silence witnesses. Epps (Julianne Marguiles) is the first to have contact with anything paranormal in the form of the young girl. In some cases, members of the salvage crew see scenes play out before them and in others they’re part of the scenes. [easyazon_link identifier=”B003VA3JUO” locale=”US” tag=”rabidreaders-20″]Ghost Ship[/easyazon_link] does not skimp on gore. Throughout, the girl is the driving and defining force to explain to Epps and the audience the reason that the salvage crew is falling one by one. It’s been a long time since I found a horror movie truly chilling, but this is one that I would call suspenseful certainly. Many times throughout, I was convinced that there would be no survivors, and bodies would be found by the next salvagers to find the ship. One of the great things about [easyazon_link identifier=”B003VA3JUO” locale=”US” tag=”rabidreaders-20″]Ghost Ship[/easyazon_link] is the size of the ship itself. As viewers sink into the film, the options are endless and the end is a one-two punch of creepiness that has me going back to watch again and again. What could have been a very run-of-the-mill horror film is capped with a brilliant premise and creepy ending that has me recording whenever its on television if only to watch that last five minutes again. 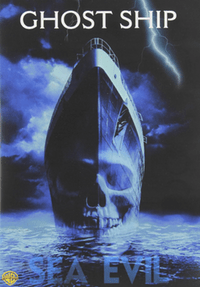 Is [easyazon_link identifier=”B003VA3JUO” locale=”US” tag=”rabidreaders-20″]Ghost Ship[/easyazon_link] the best horror movie you’ll ever see? No. If you’re looking for a good way to spend two hours that will chill your blood while celebrating a good story and better acting, pick this one up today.